Now that we have entered Spring, being outdoors and enjoying the warmer weather is the top priority on our list. Families have begun to gather ideas on how to spend their spring and summer weekends. As an agritourism destination owner or operator, have you thought about how you will promote your destination so yours makes the list of potential visitors? An attractive advertisement or an inviting social media post are sure to catch the attention of visitors. The more promotion and information you have readily available for interested visitors, the more likely they are to add your destination to their go-to list! To help you get started on the right foot when it comes to promoting your farm, we have compiled ideas about what you can do to get the word out about your agritourism destination. To start off, you should establish a logo and determine your contact information to include in all of your print and electronic materials, such as advertisements, letters, social media posts and flyers. Include your business name, logo, contact information and slogan that represents your destination. This will make your destination easily identifiable if a standard “look” is established. Using social media can be key to success in today’s tech-savvy world. You are sure to attract visitors if you have a Facebook page and keep it up-to-date. Google searches are often the first place an interested visitor looks to find information about your destination, and often a Facebook page leads the search. 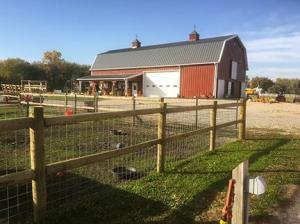 Include special events and activities that encourage visitors to make the trip to your farm. For more assistance on how to set up your Facebook page, see our November newsletter article. Keeping your community updated about your destination will keep them interested. Write articles or news releases that can be submitted to your local newspaper. Include season opening and closing dates, hours open and information about activities or events that will be hosted at your destination. If a special event will be taking place on your farm, write an article about it to inform the community. The more people are aware of your brand, the more interested they become. Submitting advertisements to your local newspaper or advertising service will increase the awareness of your farm. Also, creating flyers to be placed on bulletin boards throughout your community will show how passionate you are about your operation and encourage the community to come visit your farm!